Loyalist City Brewing Company is a new brewery, opening this fall in Uptown Saint John. Located on Water Street, the brewery overlooks the Saint John Harbour and Bay of Fundy. Named to honour Saint John’s Loyalist roots, the brewery is the brainchild of three friends and homebrewers from the region. We chatted with Ryan, Mark, and Dave of Loyalist City to learn more about their brewery. Ryan: We are three homebrewers who were raised and live in Saint John, NB. Our friendship began around 2011 and our mutual trust, along with a passion for brewing beer, has grown to the point that it was natural for us to enter the competitive craft beer brewing market. Mark: Sam Adams Boston Lager would have been the first craft beer I tried back in my university days. At the time there wasn’t much available locally but you could find the odd keg of Boston Lager on tap at the local bars. After that Picaroons began to appear on the scene more often and my love of craft beer has taken off since then. By the time I had began brewing partial mash kits my love of craft beer had taken full hold. Ryan: During a period of time when I travelled and worked in the NorthEast US I was exposed to the broad craft beer selection and styles available. Dave: My adventures with craft beer started after university. Picaroons and Pumphouse were my first exposure to craft beer. They were the two larger craft breweries in the province and introduced me to some styles of beer that I didn’t even know existed at the time. Since then, I have tried many different styles of beer and keep the adventure going by even planning vacations around beer festivals and great beer cities. 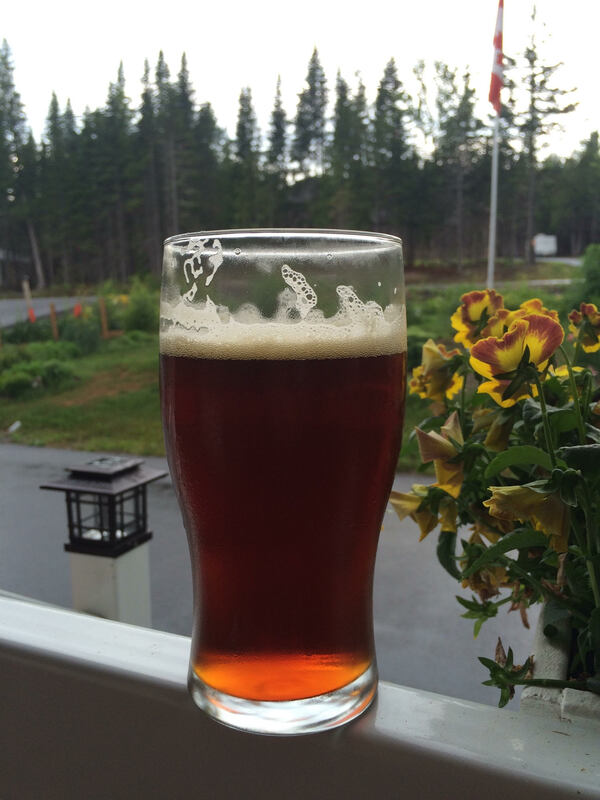 Mark: I brewed my first batch of homebrew from a Coopers extract kit in 2004. At the time I was living at home and was able to pilfer some equipment from my dad who made wine. I had brewed a few Coopers kits and progressed to some Mr Beer kits but I was never excited about the end result. I shelved my brewing equipment for a few years before being introduced to partial mash brewing in 2011. I progressed quickly from partial mash to all grain brewing on a 3 vessel keg system and Dave and Ryan started brewing with me when I switched to all grain. Since then we have brewed over 100 batches and progressed through a few different equipment setups all using the single vessel approach. Ryan: My parents homebrewed so it was natural for me to make my own clones of the great beer that weren’t available in New Brunswick at the time. Dave: In university, I experimented with some Festa Brew kits and some extract brewing. At the time, I had not done any research on brewing and did not know the importance of fermentation temp and other processes, so my results were mixed and I gave up on the kits. As I started diving into the world of craft beer, I got the urge to brew my own beer and jumped straight to All Grain brewing on Mark’s recommendation. My initial all grain setup consisted of a 5 gallon pot on a stovetop, doing BIAB batches in 590 square foot condo, which got messy at times Ha! I was surprised by the quality of beer that could be produced by such simple equipment and applying consistent approaches and methods. I have since moved on to brewing on a 5 gallon electric system at home and brewing with Mark and Ryan on the half barrel pilot system. Mark: I have always enjoyed sharing my beer with other people that appreciate a good pint. 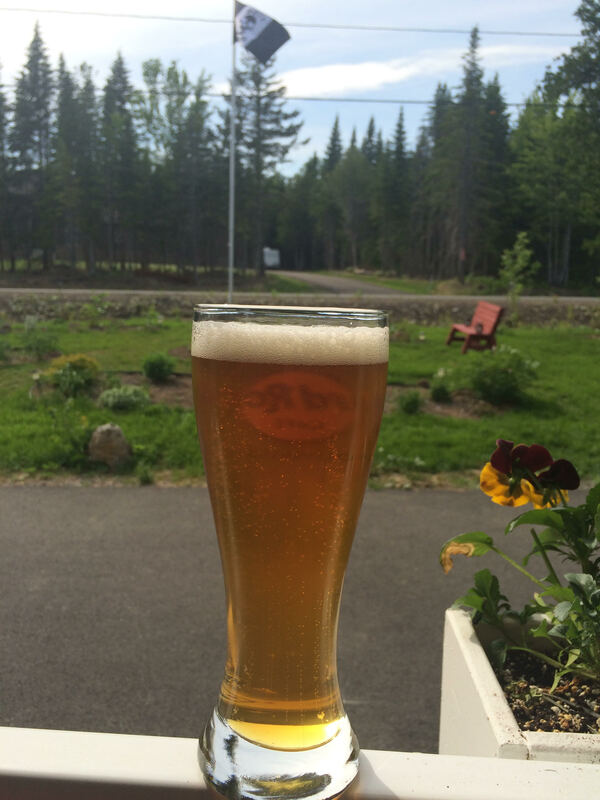 As I progressed as a homebrewer and started entering competitions I found myself brewing many styles of beer that I wasn’t able to buy in New Brunswick. I really enjoyed learning the history of a style, tracking down some modern examples, and recreating it with the best ingredients I could find. I had decided long ago that doing this on a larger scale would be a more challenging and more rewarding endeavor. Ryan: We’ve observed first hand the growth of the NB craft beer market over the past 5 years and decided that we wanted to participate in the growing market with the goal of being the best rated nanobrewery in New Brunswick. Quality and not quantity will be our primary goal. Dave: Jumping into the world of professional brewing seemed to be the natural next step in our brewing progression. As the batches rolled on, we found ourselves experimenting more and more with yeast strains, quality of grain, and different hop varieties. We improved our processes and methods in order to get our batch consistency to a high standard. We want our beer quality and consistency to be the cornerstone of our brewery and we are are ready to share it with the craft beer community! 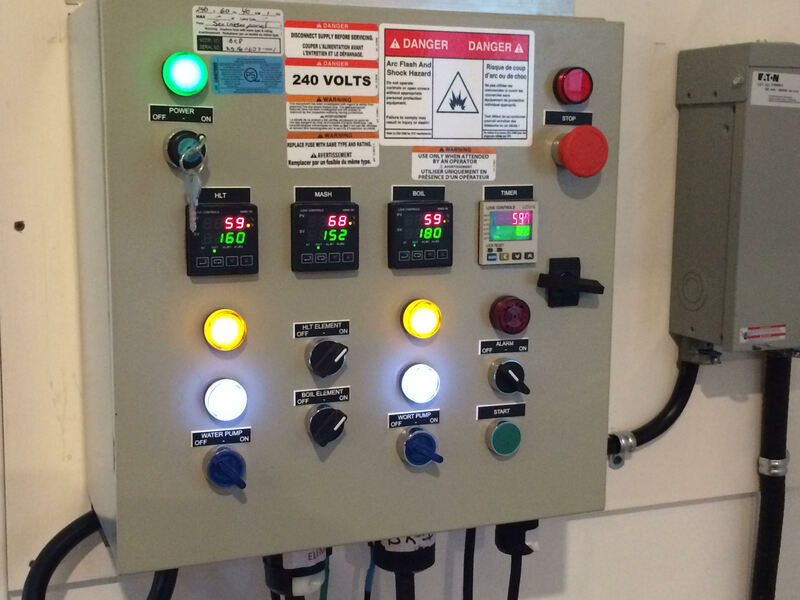 Our brewhouse is a ~6 bbl (200 US gallon) PLC system from Colorado Brewing Systems. The three of us have been brewing for years using the BIAB method and decided early on in the planning stages that we wanted our commercial system to leverage the benefits of BIAB. Colorado’s systems are among the best single vessel brewhouses available today on the commercial scale and after speaking with the owner of Colorado Brewing Systems we decided to move ahead with their largest system. Initially our plan is to brew 4 batches a month to fill our four fermenters and allow our beer time to mature in a controlled environment before being released to our accounts. Mark: If all goes to plan we should be brewing Mid-October, with beer available mid November. We are working with NB Liquor and the Federal Government to navigate through the application process now. Mark: We are currently working through the process to become licensed to sell growlers onsite and distribute directly to bars in the area. We are really looking forward to partnering with some of the amazing local restaurants and bars in our area. Being in the Uptown core was critical for us so we could build a relationship with the many vendors in the area. Our core line up consists of five beer that we plan on always having available for our accounts, an American IPA, a “Commonwealth” Pale ale, an English pale ale, a German Hefeweizen, and a Dry Irish Stout. We will continually be brewing seasonal variations of our line up and are working on securing hops for our hop series of beer now. We plan to release a series of IPAs featuring hops from different regions in the US, New Zealand, and Australia. The craft brewers in our area have all been very supportive. Over the past few years we have been able to have some great talks with Shane at Hammond River Brewing about the experience of running a brewery and distributing in the local markets. Mark: Our tastes are pretty broad and like many homebrewers our focus initially was on hoppy styles. We enjoy experimenting with the different styles of IPA and brewing East Coast, West Coast, and Australian style IPAs. We have branched out in the past few years to appreciate the roasted complexity of stouts, and the malt forward english styles. A personal favorite of mine these days has been sour beer, I have been enjoying trying to create some of the complexity that you find in a well-made Flanders red and Berliner Weisse. Thank you to Mark, Ryan and Scott for filling us in! Be sure to check out Loyalist City’s website, and keep an eye on their Twitter, Facebook, and Instagram pages for progress pics as they work towards their November launch. The number of craft breweries in New Brunswick continues to rise, as Bogtrotter Craft Brewing quickly came on the scene earlier this month and announced that it would be opening soon in Fredericton. Owner and brewmaster Rod Croucher has been homebrewing for about 10 years, and has decided to take the first step in turning his hobby into a career. We recently chatted a little with Rod to find out more about the brewery, and his plans for when it launches next month. I served in the military for 23 years, and I got out about 4 years ago. I retired in Alberta from the PPCLI, and worked as a realtor in the province. My wife and I then decided to move back home – I grew up in the Fredericton and Oromocto area, and have strong family ties to the area. When I lived in Alberta, there was a huge selection of beers from around the world. Currently I am running the brewery myself out of my home. I have a 1 BBL (115 L) electric HERMS system, with 7 fermentors. When exactly do you plan on launching next month? I’m launching with three beers on Saturday, September 24th. We will be starting at the Station (ANBL) downtown with Saturday Sips in the Afternoon, followed by a stop at another establishment (hopefully, still working on the details), and finishing up with an event at the James Joyce at 8:00 pm. My goal is to brew small batches of quality beer. My plan is to start in local restaurants and other licensees in the Fredericton area. We won’t be licensed for on-site sales at this time. I have talked to a few establishments in Fredericton, and there is definite interest in the products. Muddy Mayhem IPA, an American IPA, 6.2% ABV, 85 IBUs, and dry-hopped. Angry Otter Pub Ale, an Extra Special Bitter, 5% ABV, 45 IBUs. Osprey’ Orange Pale Ale, a light-coloured beer with additions of orange peel and coriander seed, 5% ABV, 40 IBUs. I would love to expand to a tap house depending on the response I get to my beers; hopefully this happens within a year or so. 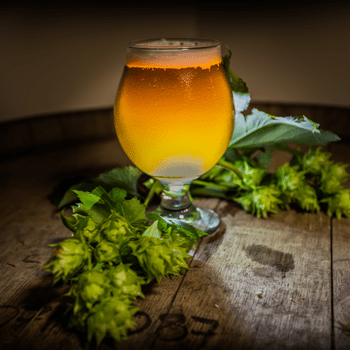 I’m a self-proclaimed hop head – IPAs and Imperial IPAs are my favourite styles – so anything with high IBUs and hops flavour works for me. We wish Rod the best of luck with his new brewery, and look forward to Bogtrotter’s launch next month! We’ll let you know more about the launch-day events in a few weeks; in the meantime, be sure to follow Bogtrotter on Facebook and Twitter, for updates on their progress.